Sparkly Glitter Pumpkins – EASY No Carve Pumpkin Idea For Halloween! No carve pumpkin ideas are great for when you don’t have the time to carve pumpkins or just don’t want to deal with the mess. Hey, don’t judge me lol. These sparkly glitter pumpkins are not only super easy, but beautiful as well. There are so many ways you can use these glitter pumpkins for fall. Group some of these pumpkins together to make a breathtaking fall centerpiece that will add the perfect amount of sparkle to your table. Another great idea is to use them as party favors. Last year my mom made mini glitter pumpkins and handed them out as a fall baby shower favor. 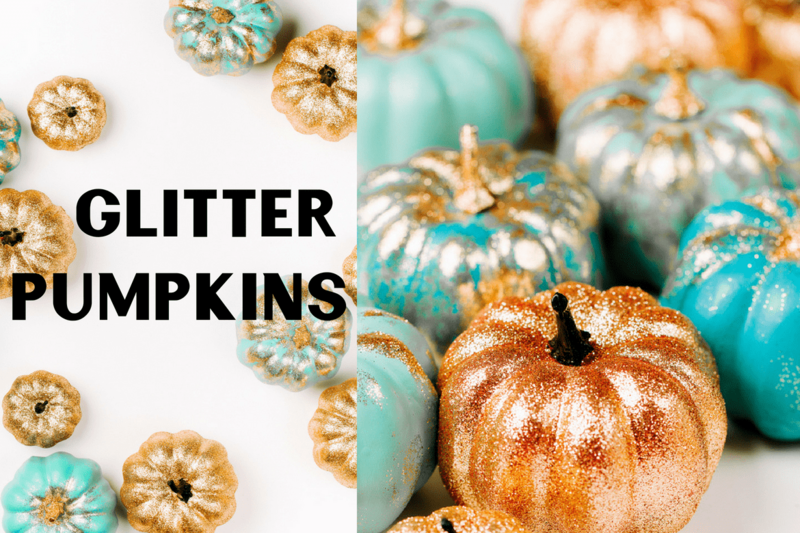 If you’re looking for an inexpensive party favor at your next fall or Halloween gathering, just make some glitter pumpkins! The design variations are endless for these glitter pumpkins. You can cover your entire pumpkin with glitter or opt to do only half. Another cute way to decorate your pumpkin with glitter is just drawing a design or making glitter polka dots. You can also paint your pumpkin a color first, then glitter only half of it leaving some of the exposed paint color. Below you will find the directions for these sparkly glitter pumpkins. Set up your glitter station. Lay out newspaper onto the table and place your paper plate on top of it. Start off with a clean slate. Wipe off your pumpkins with a damp rag and blot dry. Grab a brush and start painting glue onto your pumpkin. Don’t make it too thin or thick. With one hand hold your pumpkin by its stem over your paper plate. With your other hand scoop some glitter out with a plastic spoon. Sprinkle glitter all over your pumpkin. Rotate your pumpkin, glitter, and repeat. Your paper plate should catch all the excess glitter. Spray your pumpkin lightly with hairspray and let dry. 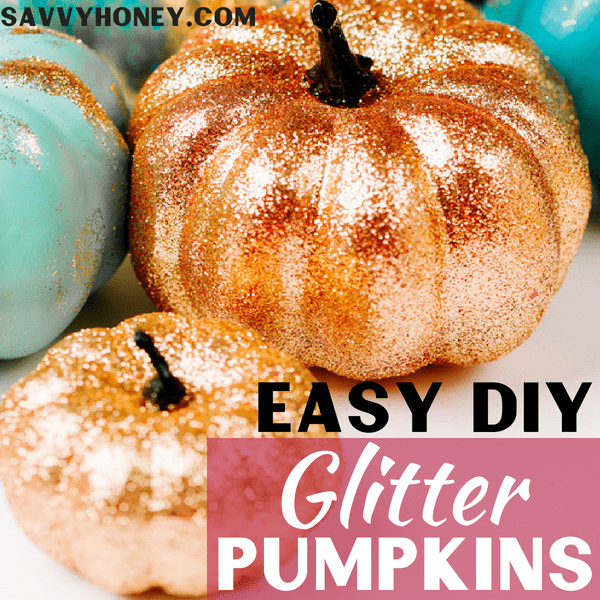 This will keep a little seal on your pumpkin and prevent glitter from getting everywhere. Cleanup should be a breeze. Dump out excess glitter from your paper plate back into your glitter container and throw away the paper plate and newspaper. And just like magic you have a sparkly glitter princess pumpkin! Let me know how they turned out below! Love them!!!! I’m so like u I hate the mess it makes! !